One of the most promising approaches to the control of many epithelial malignancies is to detect cancers before they have metastasized. Effective screening strategies have been developed and are widely utilized in clinical practice to detect cervical, breast, prostate and colorectal cancers. In the case of epithelial ovarian cancer, the ability to cure early stage disease provides an attractive rationale for the development of similarly effective screening strategies. Despite the improvement in median survival achieved with contemporary cytoreductive surgery and combination chemotherapy, ovarian cancer that has spread beyond the pelvis at the time of diagnosis can be cured in no more than 20% of cases. By contrast, when ovarian cancer is detected in Stage I, before it has spread from the ovaries, 90% of women can be cured with currently available therapy. 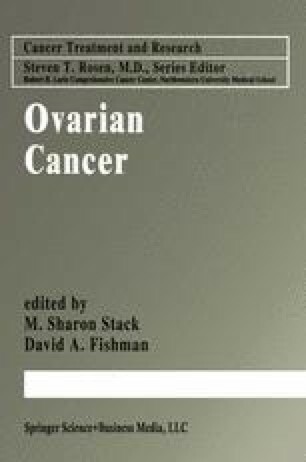 At present, however, only 25% of ovarian cancers are diagnosed in Stage I (Ries et. al, 1999). Consequently, detection of preclinical disease at an earlier stage in a larger fraction of women might improve overall survival.